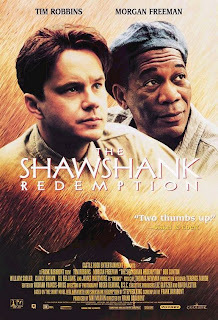 The Shawshank Redemption (1994) is currently rated #1 on imdb.com's Top 250, only after The Dark Knight swept the long reigning The Godfather back in July 2008. I was reading that Shawshank was not very popular in it's day, but garnered respect when it was released on video. In fact, it was a box office failure, and was struggling to get any profit, but then it turned out to be the most rented video of 1995. Go figure. I believe that a movie in the Top 10 of the Top 250 should have won an Oscar, but this movie was nominated for seven, including Best Picture, which it lost out to the classic Forrest Gump. It never even won one Oscar. So what makes this movie so great? It is a landmark in film history, a story about hope, shown in the most violent and heart-wrenching way possible. The Shawshank Redemption was a Stephen King novella originally named 'Rita Hayworth and the Shawshank Redemption' (a title dropped because people thought it was a bio-pic on Rita Hayworth), about Andy Dufresne (Tim Robbins), a prominent banker who is convicted for the murder of his wife and her lover, and sent to Shawshank Prison in the late 40s. There he meets a world of emptiness, where the in-mates hate him and the prison guards show no mercy, and a murder is never a surprise. Andy never speaks to anyone, until two years into his life sentence he befriends Red (Morgan Freeman), a con-man who is known 'to be able to get things'. These two strike up a friendship, and Andy starts to make a difference at Shawshank, but is desperate to get back to his old life. This movie is great. It does deserve the top spot on every list of great movies. Because it is the best movie ever made, and shall stay that way for a few more years to come.